Rollerblade Fly 4x100 Race Frame 13.3"
The quality Rollerblade Fly Frame 4x100 - the Alrounder! Rollerblad Fly Speed Frame 4x100, 13.3"
Rollerblades Fly Frame offers stability and lightness. The speed frame is suitable for fitness and speed skating. The precision-engineered speed frame is manufactured from high quality 7000 aluminum. For four 100 mm wheels. 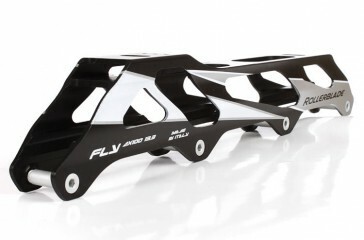 You're reviewing: Rollerblade Fly 4x100 Race Frame 13.3"